Those are some of the stereotypes I’ve heard through the years. So I thought I’d share my experience of what it’s really like to get a drivers license here in Tennessee. Perhaps some will find this information helpful (or at least comical). Hint: It’s a lot easier (and quicker) than you’d think! Jim was one of the lucky ones… His driver’s license expired in March and he was allowed to just send in the renewal fee, upon which they mailed him his new license (same picture, new expiration date). I was less fortunate… in a sense. Because of a new law that went into effect on July 1st, I had to physically visit the driver license branch, and present my birth certificate (or Social Security card) AND my old license. If you didn’t bring the notice they sent you in the mail, then you also had to fill out another application. Of course, I had mine… AND my voter’s card, AND a copy of my last utility bill (just in case I needed to prove residency or something — I wasn’t taking any chances). What I didn’t have on me was my checkbook! Checks? Who carries checks these days??? I’m thinking: “I don’t even know where our checkbook IS!” I’m kindly told: “Sorry, only cash or checks.” (The odds of me having cash at any given time are even less than the odds of me knowing where our checkbook is!) UPDATE: They take credit cards now. Okay, But How Did Your Picture Turn Out? For years, I’ve secretly wished that I could change the photo on my OLD driver’s license. I’m not the only one who wants to look good on their driver’s license photo, am I? I mean, you at least want to look respectable enough for the “ID of all ID’s” — the one you’re forced to carry around for the next FIVE years — right? By the looks of the other ladies in the driver’s license branch on this day, I’m guessing I’m not alone. The dudes all seemed comfortable with their “as is” appearance (like having walked in straight from the construction site, or sweaty with kids in tow on a dad’s day out). All this, and I still managed to get there (the 2nd time) by 10:30 a.m.! What’s The Driver License Process Like? When you walk in, you’re printed out a number that’s prefaced by an A (renewal), B (new license) or C (drivers test — I think). Then you sit and wait. My wait was under 10 minutes. When a worker is ready for the next person, they hit a button, and a digital voice comes over the speaker asking the person with that number to step to the counter. You give them your old license, show your birth certificate, and hand over $19.50, then they send you to the “blue wall” to have your picture taken. Girls, there’s no mirror there, but if you look real close, you can use the reflection from the lens of the camera to prepare for your big moment. Only if your eyes are closed will they take a second photo. The good news?… At least the Listerine Pre-Brush Whitening Rinse appears to be working! I was in line with Dave Ramsey. After he left the building, one worker said to another: “You know who that was, right?” The other wasn’t impressed. He said “I just treat them all the same…” Then he told me of his run-ins with the likes of Lily Tomlin, Diana Ross (or was it Donna Summer?… maybe even Dionne Warwick — I get all those “D’s” from the 80s confused!). I said, “HERE? !” To which he quickly replied, “No, when I worked at Kinkos for years.” (Personally, I’d have thought one would have better chances of seeing such people at the driver’s license branch than at the Kinkos, but he knew it to be true… so I’ll take his word for it.) Then he added that he had also processed the driver’s licenses of the Judds. Guess I’ll have to add “county offices” to my list of places to see celebrities around Nashville! 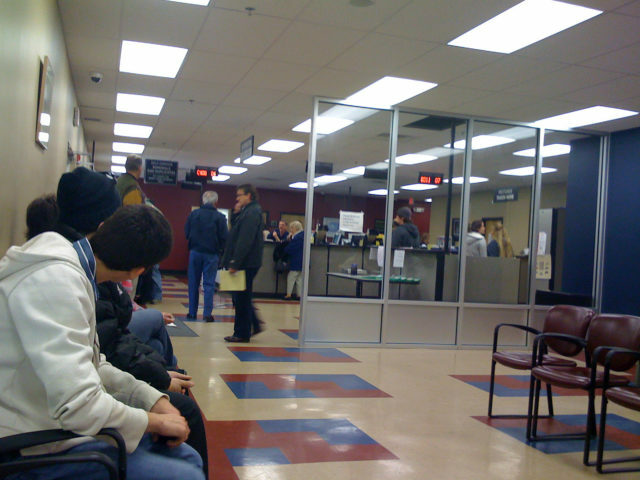 So, I am happy to report that my experience with renewing a drivers license in Tennessee — specifically in Williamson County — was quite pleasant on all counts. I would strongly recommend visiting this branch if you live in Williamson County. Oh wait, you have no choice… there’s only one branch in Williamson County. of people that winds down the sidewalk and into the parking lot each morning on my way to work! Luckily they’re open early (7:00am), and kind of late (5:30pm), but from the looks of things, most try to take advantage of the early morning time slot, so I’d recommend not going at that time. I was there at 10:30 a.m. on a Friday, and one of the workers even commented how that was a good time to come, adding that normally this place is crazy busy from open to close. If I were going again, I’d pick 10:30-11:00 a.m. or 2:00-3:00 p.m.. Oh, and don’t try going on a Monday… they’re closed on Mondays! Actually, I want to compliment all of the individuals who were working at this particular driver license branch — from the lady who greeted me and printed out my #A21 (which probably means that 20 other people had gotten renewals up til my arrival at 10:30 a.m.), to the one who processed my renewal (Essam), and the one who had a firm command of the Spanish language (Mike) and was called on to assist a number of people. Props to you all for helping to make this process easier and more enjoyable than I’d envisioned. Do some states call it a “driver’s license”? I’m wondering if that’s just something I picked up in Indiana, Texas, Ohio, or Florida… Because it just doesn’t seem right to call it my “driver license” or to say I’m going to the “driver license branch” — despite the fact that’s what the state of Tennessee calls it. Hmmmmm…. Thankfully, the process is so much different these days! I went in to renew my Tennessee driver license today and all I had to do was walk up to the next vacant kiosk and spend 2 minutes updating my address and standing still for a photo. You start by placing your current drivers license on the kiosk table with the barcode facing upwards. Then the kiosk walks you through all the steps. You do everything yourself! The kiosk prints out a receipt (after your pay the $17.50 + $2.00 kiosk fee) with your new picture on it. They say you’ll receive your new license within 2 weeks. One tip: You get only 1 chance to re-take the photo if you don’t like how the first one looks. My advice is to step back a teeny bit further than the yellow footprints they want you to stand on for your photo. (There’s no one watching.) Otherwise, if you stand right on the footprints, your photo is pretty much “all face” and no background — like mine turned out. I wish I had stepped back a half-step to get a little bit of neckline and shirt collar in the photo.